In a 5-3 Split, Utah v. Strieff Causes Strife for the Supreme Court: What Happens When an Illegal Stop Leads to the Discovery of an Outstanding Warrant? The Supreme Court has had a busy term already! 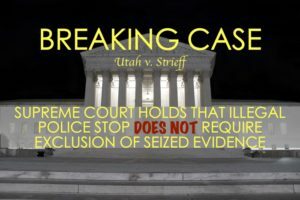 Handed down just yesterday, Utah v. Strieff divided the Supreme Court over the question of what happens when an illegal stop leads to the discovery of an outstanding warrant? And when that warrant is executed, what happens when drug paraphernalia is found incident to arrest? Should evidence obtained at a search incident to arrest be suppressed when the stop was unlawful from the start? In Strieff, law enforcement conducted surveillance of a Salt Lake City, Utah, residence, after an anonymous tipster called a drug hotline to report to police that drugs were being sold in the home. During the surveillance, police observed a large number of people visiting the home for mere minutes at a time and leaving, increasing law enforcement’s suspicion that the residents were dealing drugs. Shortly after Edward Strieff visited the home, law enforcement stopped and detained Strieff, asking him the reason for visiting the home. Next, police ran Strieff’s identification information through their electronic records, discovering an outstanding arrest warrant on Strieff for a traffic violation. Strieff was arrested and searched. During the search, police found a baggie of meth and other drug paraphernalia in Strieff’s pockets. Strieff was charged with unlawful possession of methamphetamine and drug paraphernalia. Strieff Moves to Suppress the Evidence as the Fruits of an Illegal Police Stop. At trial, Strieff moved to suppress the evidence as a result of an unlawful investigatory stop. Strieff argued that because law enforcement’s stop was illegal from the beginning, then any evidence found on him as a result of the stop was “tainted.” The State argued that the evidence was in fact admissible because it was found as a result from a search incident to a lawful arrest with a warrant, and that the warrant itself attenuated the connection between the unlawful stop and the discovery of the drugs and drug paraphernalia. Agreeing with the State, and finding the presence of the arrest warrant to be an “extraordinary intervening circumstance” the trial court denied Strieff’s motion to suppress. United States v. Simpson, 439 F.3d 490, 496 (CA8 2006). Strieff pleaded guilty to a lesser charge, but preserved his right to appeal. Utah Supreme Court Holds that Illegal Police Conduct Was Not Attenuated. On appeal, Strieff argued that the evidence should have been suppressed at trial. However, the Utah Court of Appeals affirmed the trial court’s ruling. 2012 UT App. 245, 286 P. 3d 317. On appeal to the Utah Supreme Court, Strieff argued that the evidence should have been suppressed at trial and that the court of appeals was incorrect in their verdict. The Utah Supreme Court agreed with Strieff, and reversed the lower courts’ rulings, ordering the evidence to be suppressed. 2015 UT 2, 357 P. 3d 532. In declining to apply the attenuation doctrine, the Utah Supreme court held, “the evidence is inadmissible because only a voluntary act of a defendant’s free will sufficiently breaks the connections between an illegal search and the discovery of evidence.” Id. at 536. The State of Utah appealed to the United States Supreme Court. Strieff contends that the facts of his case show that he was stopped illegally for the purpose of obtaining his identifying information, and that because of flagrant police misconduct, he was detained and searched unlawfully. US Supreme Court Must Determine Whether Illegal Police Conduct Must Result in Exclusion of the Tainted Evidence. When a police officer lawfully stops a person and asks for identification, then, discovers that there is a traffic warrant for this person’s arrest, and in the process of arresting and searching him discovers drugs and drug paraphernalia, the evidence found in the search of a person can be used against him. However, what if the initial stop was not lawful. Doctrinally, does the “attenuation doctrine”—an exception to the exclusionary rule of the Fourth Amendment—apply when law enforcement makes an unconstitutional investigatory stop, discovering during that stop that the suspect is subject to a valid arrest warrant, and then, arrests the suspect, seizing incriminating evidence during a search incident to arrest? The Fourth Amendment to the United States Constitution provides, “ the right of the people to be secure in their persons, houses, papers, and effects, against unreasonable searches and seizures, shall not be violated, and no Warrants shall issue, but upon probable cause.” U.S. CONST. amend. IV. To enforce the Fourth Amendment’s prohibition against unreasonable searches and seizures, “[the Supreme] Court has required…courts to exclude evidence obtained by unconstitutional police conduct” via the exclusionary rule. Utah v. Strieff, 579 U.S. ___(2016). The Exclusionary Rule to the Fourth Amendment is a legal principal, put forth by the Supreme Court in precedent case law, protecting defendants in criminal cases where evidence is collected in violation of a person’s constitutional rights, by deeming the evidence inadmissible for criminal prosecution. Mapp v. Ohio, 367 U.S. 643, 655 (1961). The Exclusionary Rule encompasses both the “primary evidence obtained as a direct result of an illegal search or seizure [and] evidence later discovered and found to be derivative of an illegality.” Segura v. United States, 468 U.S. 796, 804 (1984). However, courts will only apply the exclusionary rule, “where the deterrence benefits outweigh its substantial social costs.” Hudson v. Michigan, 547 U.S. 586, 591 (2006). Over the years, the Supreme Court has recognized several exceptions to the Exclusionary Rule, one of which is called the “Attenuation Doctrine.” The Attenuation Doctrine provides for admissibility when the connection between unconstitutional police conduct and evidence is sufficiently remote or has been interrupted by some intervening circumstances. Id. at 593. The doctrine “evaluates the causal link between the government’s unlawful act and the discovery of evidence.” Strieff, 579 U.S. ___ (2016). The factors, articulated in Brown v. Illinois, 422 U.S. 590 (1975) (the “Brown factors”), are used by courts in legal analyses to determine whether the Attenuation Doctrine is applicable to the facts of a case. The three factors are temporal proximity, intervening circumstances, and flagrant police misconduct. Temporal proximity—For example, how much time did it take for police to stop the suspect and to arrest him, and under what circumstances? Intervening circumstances—For example, did the suspect make a confession, or volunteer some other information to law enforcement to indicate that he has committed a crime? Flagrant police misconduct—For example, did police act in an unethical manner to discover evidence, or, is there a pattern of misconduct for that officer or police department as a whole? The Supreme Court Holds That The Valid Arrest Warrant Attenuated the Taint of the Illegal Stop. First, the “temporal proximity” factor “favors suppressing the evidence,” the Supreme Court states, as the stop was initially unlawful and because law enforcement discovered the drug paraphernalia on Strieff mere minutes after he an illegal stop. However, the other two factors strongly favor the State. Additionally, the Supreme Court says that Strieff’s arguments are not persuasive. Law enforcement did not stop Strieff randomly. Strieff had visited a suspicious house that was under surveillance. Law enforcement’s purpose in surveilling the residence was to “gather information about activity inside a house whose occupants were legitimately suspected of dealing drugs.” Further, it is “unlikely that the prevalence of outstanding warrants will create dragnet searches,” says the Supreme Court. Three Supreme Court Justices Dissent and Would Hold That the Illegal Stop Requires Exclusion of the Seized Evidence. Additionally, Justices Kagan and Ginsburg dissented together. The Justices argue that the majority misapplied the Brown factors altogether, and that an outstanding warrant in and of itself does not an intervening circumstance make. Further, they argue that the outcome of this case invites law enforcement to stop citizens, even without reasonable suspicion. “If the target[ed] [citizen] is one of the many millions of people in this country with an outstanding arrest warrant, anything the officer finds in a search is fair game for use in criminal prosecution,” the Justices argue. Thus, law enforcement’s incentive to violate the Fourth Amendment increases, which is in opposition to the purpose of the Exclusionary Rule altogether—to remove potential temptation from police to stop random individuals without reasonable suspicion. This is a very troubling decision. While we never hope that our police officers would engage in illegal conduct to stop folks that have not committed a violation, it is never good to allow a 4th Amendment violation to be trumped by the later discovery of a traffic warrant. If we subscribe to an “ends justify the means” mentality, all of our constitutional rights are in serious jeopardy. It will be interesting to see how this decision plays out in real life, but I predict that it will not be good in the short term.